The Ferry Building is West Vancouver’s first designated heritage building. Before the Lions Gate Bridge was built in 1038, the easiest way to get to the city of Vancouver from the North Shore was by ferry and the Ferry Building in West Vancouver was the terminal. The ferry building at 1414 Argyle Avenue still stands today and is operated as an art gallery. My mom grew up in West Vancouver and she took the ferry to work in Vancouver. 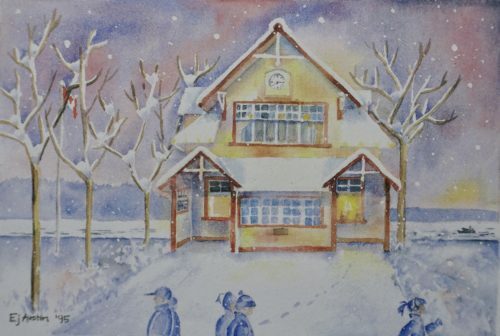 This painting was juried for the Municipality of West Vancouver’s Christmas Card in 1995.